The Legacy Chronicles: My first Blogville mail! OMD, this is SO exciting! I actually gots my very furst mail ever!! Momma says that now I'm part of Blogville, I'm going to get lots of mail. But THIS one was special because it was furst. I didn't even realize at first what she meant by "this mail is for you!" Then I was so excited, I tried to eat the card. Thanks, Aunt Madi! You're the best! PeeS: I'm starting Puppy Class tonight. I'm very nervous. Cross your paws I do okay! Madi is so thoughtful always! You will do great at puppy class, Matilda. Wait till you see all the treats you'll get! You're going to love it! And Matilda the good news is none of your mail will ever be in the form of bills always full fun. You are very welcomed into blogville. I predict you will be Princess of the Puppy class. Madi and her mom are always so thoughtful. Good luck at your class. We know you will do great and meet lots of new friends. We think you'll do great and be a star pupil. That was so sweet of Madi! You'll do great at class! Just relax and have fun. 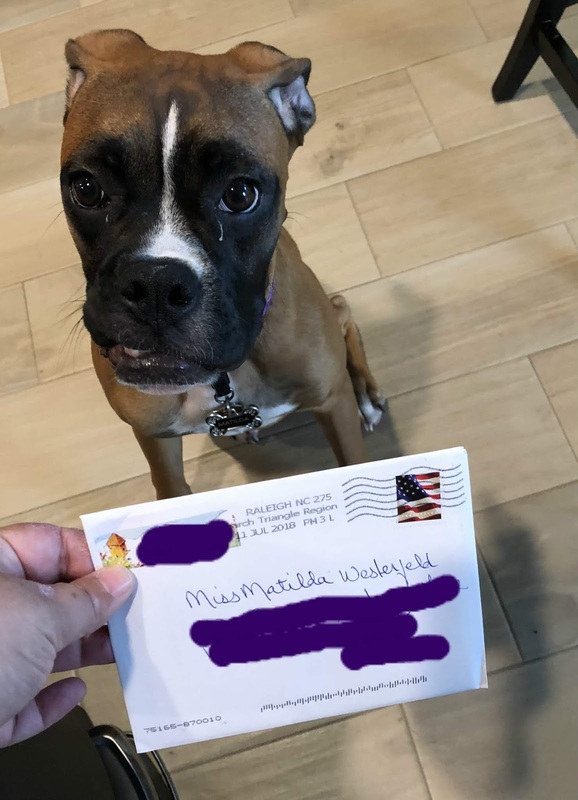 As soon as we saw that you got mail, we just knew it had to be from Madi - she is so thoughtful and kind. That Auntie Madi is the bestest!!! I think you wil LOVE puppy class Matilda...you get to meet new friends and, OMD...you won't believe all the treats you will be given!!! Madi is the best! hope you had lots of fun at puppy class! Oh Madi is the bestest furiend evers!!!! That is one FABulous card gurl!!! I just knows you will do FABulously at puppy class! Tells your Moms to take lots and lots of pics!